We've reached the end of the first full day of the T^3 2014 conference in Las Vegas, and although the night is still young, the educational portion of the day has been chock-full of fascinating sessions taught by knowledgeable, enthusiastic teachers. The day started with a warm welcome from TI Education's Director of Marketing Gayle Mujica and President Dr. Peter Balyta as well as an inspiring (Nspiring?) talk from educational technology proponent Dr. Alan November. We covered the opening session in an in-depth news article posted the moment it concluded. The remainder of the day was filled with a wealth of plenary sessions, with around 150 total sessions taught over a period of six hours. The options ranged from algebra and calculus to physics and statistics. Considering my professional and academic pursuits as well as my work here, it should come as no surprise that I attended solely programming sessions throughout the day. I began with "Hello World: Lua Programming From the Ground Up" at 10am, taught by Bryson Perry and Becky Byer. It helped me brush up on both Lua in general, which I haven't worked with much since creating LuaZM, and on TI-Nspire specific Lua programming. After a brief lunch in the hotel and a stressful quest to get two packages of books that my publisher shipped to me, it was time to give my own talk at 12:30pm. I taught "Teaching Beginner Programming Concepts with the TI-83 Plus Graphing Calculator and TI-84 Plus Graphing Calculator Family" to a rapt audience of about 11 attendees. I rushed through a great deal of information, and probably slightly overwhelmed the teachers, but a lot of them did seem to have a serious interest in bringing programming into the classroom. To cement that, the next three sessions I attended were also taught by teachers who had been exploring programming in the classroom. In order, they were "Teaching TI-BASIC Programming to 8th Grade Mathematics Students with the TI-83 Plus Graphing Calculator" by John Isaacs, "An Introduction to Easy Programming on the TI-83 Plus Graphing Calculator and TI-84 Plus Graphing Calculator Family" by Jan Erik Woldmar, and "Make the TI-84 Plus Graphing Calculator Family Your Programming Tool" by Mark Von Rosenberg. All three sessions showed me a new perspective on programming our favorite graphing calculators, and showed me that they face some similar and some very different challenges from the ones we tend to encounter with our admittedly more advanced and motivated userbase. In the course of the day, I also had a chance to briefly stop by the Exhibitors' Hall to see the vendors who came to the conference. 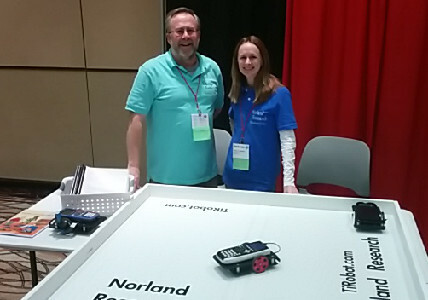 I spent time especially with Rick and Rebbecca Rowland of Norland Robotics, the folks who make the calculator-controlled robot kits. They have been stauch supporters of "Programming the TI-83 Plus/TI-84 Plus", which they offer as an optional accessory to teachers with their robot. The day concluded with a pleasant two-hour reception replete with food, drinks, and pleasant music and company by the Hotel Rio's pool area. 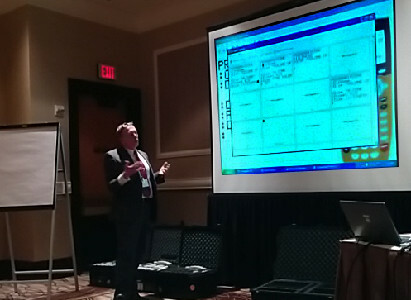 Tomorrow starts bright and early with sessions at 8am, and Cemetech will be bringing you the full story right here. If best comes to best, we may even be able to answer a few select nagging questions about the present and future of TI technology, so keep an eye right here. © Copyright 2000-2019 Cemetech & Christopher Mitchell :: Page Execution Time: 0.128699 seconds.